As shown in my first chart the ASX200 cyclically adjusted PE (ASX200 PE10 or CAPE) has been steadily declining since February. 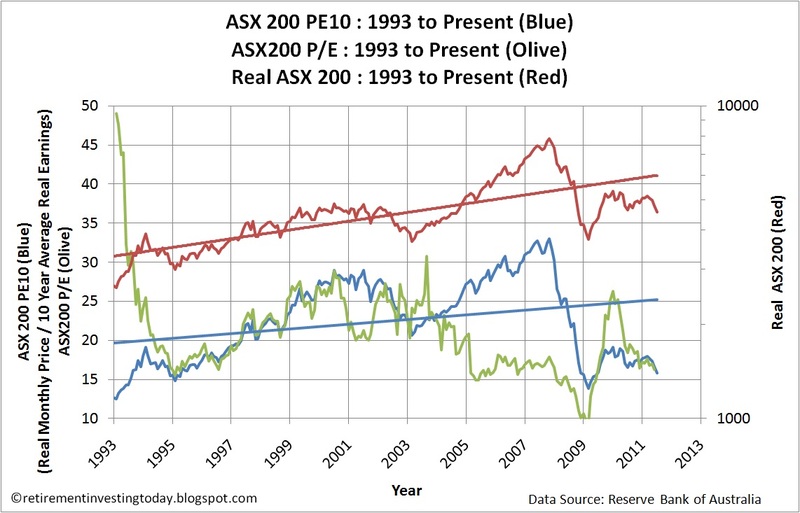 Today with the ASX200 closing at a price of 4567 the PE10 is 15.8 compared to the long run average since 1993 of 22.4. A quick look at these two values would suggest that the ASX200 is undervalued however I’m not so sure. The problem for me is that the data set that I have is a short period of time. Comparing the ASX200 to the S&P500 where I have S&P500 PE10 data going back to 1881 allows for a very crude extrapolation though. 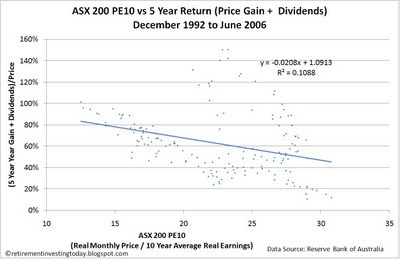 The long run average S&P500 PE10 is 16.4 however the average PE10 for the same period as my ASX200 dataset is 26.9. Extrapolating this to a long run average ASX200 PE10 reveals (22.4/26.9)x16.4=13.7 which would imply that the ASX200 is in fact not undervalued but overvalued to the tune of about 15%. To put this value in to perspective the PE10 low during the Global Financial Crisis (GFC) was 13.8 in February of 2009. I’m struggling somewhat to comprehend that during the market low of the GFC we only saw the ASX200 reach fair value. I don’t know quite what to make of it... Of course my extrapolation is very crude but it does give food for thought. The change in the ASX200 PE10 forces me to update the Australian equities tactical asset allocation of my Retirement Investing Today portfolio. From a strategic allocation of 20.5% when the PE10 is 16 my target tactical allocation is now 20.6%. My second chart today is new for Retirement Investing Today. 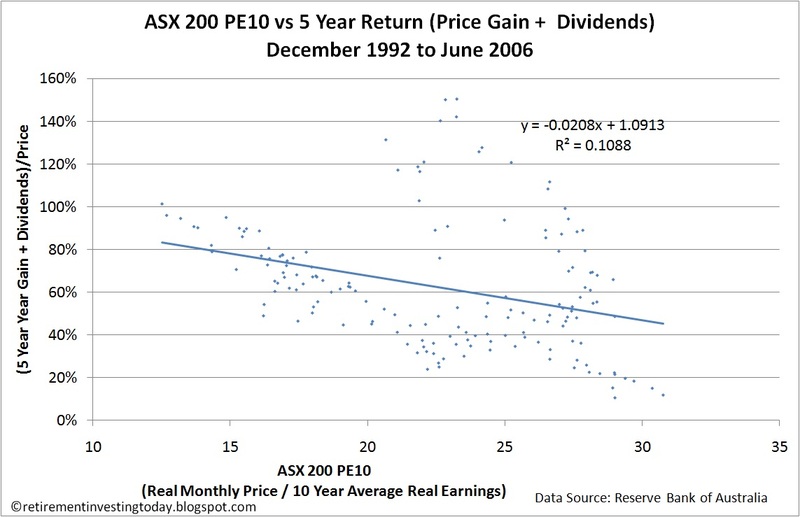 In the past this chart has always looked at the ASX200 PE10 versus the 1 year real (inflation adjusted) return (price gain + dividends). Today I am shifting the analysis to be the ASX200 PE10 versus the 5 year non-inflation adjusted return where the correlation is -0.33. I have shifted my analysis to this dataset as I am trying to understand what returns may be possible between now and my retirement which I hope will only be around 5 years from today. I have also shifted to nominal return rather than real return as whether I like it or not inflation is here to stay. The calculation method assumes that dividends are taken off the table at the end of each year (so 5 sets of dividends per data point) and they are held in a 0% interest account. Of course I’m reinvesting my dividends but this method makes the maths easy. The results in the chart show that for an ASX200 PE10 of 15.8 a possible return of between 70-90% could be possible over the next 5 years. Of course the usual problem is the small dataset but also the fact that this chart does not include the big stock market falls that we saw during the GFC. This is because this dataset only tracks to June 2006 (5 years ago) giving us still a little over 12 months to the real market peak. It will be interesting to watch this chart as we enter the peak of 2007 and move in to the GFC. - the correlation between the ASX200 Price and the ASX200 CAPE remains at 0.75. 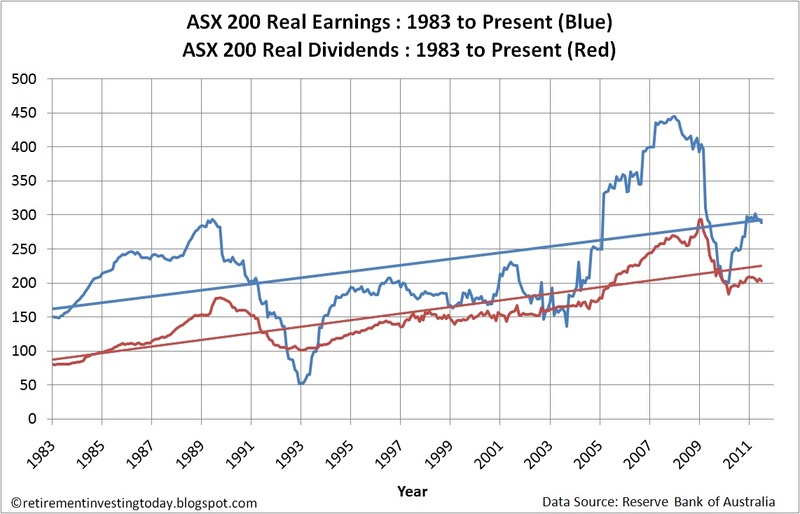 Today’s 3rd chart today shows Real (after inflation) Earnings and Real Dividends for the ASX200. Dividends are at 202.9 which is still below the long term trendline. Earnings on the other hand are pretty much on trend at 288.8. - June 2011 price is the 15 June 2011 market close. - June 2011 Earnings and Dividends are assumed to be the same as the May numbers. - Inflation data from April, May and June 2011 are extrapolated. Is there however an implicit assumption that there is statistical invariance (or whatever the right term is) for the S&P from 1881 to now. I'd challenge that. Not only has the US gone from being second empire to duopoly to lone superpower to whatever it is now, but humanity has taken advantage, post 1920-ish of the greatest gift of capital it has ever known, the energy of ancient sunlight encapsulated in oil. Or am I totally missing the point in a big way here? I'm a strong believer in the "there is no new paradigm" and that in due course everything will pass back through average on its way to either over or undervaluation (more or less positive fundamentals?). At least I hope so as that's what my tactical allocation strategy is based on. Sure history is no indicator of the future but the PE10 chart shows that it's happened many times in the past. I won't even go in to oil and debt/deficits as it is just too complicated. If we brought these in to the mix then we should also discuss World Wars etc as they will have had an effect also. You might be right that it reflects fundamentals (rather than overvaluation) however fundamentals change and I'm not close enough to the coal face or good enough to take advantage of it. For example what will a Greek default do to fundamentals. IMO that one is coming and I'd imagine it will lower the PE10 values of stock markets around the world. BTW I'm sure it won't be called a default when it happens. Although that one is fairly predictable what about something that isn't - a pandemic for example. That would have a big effect and would also reflect fundamentals. As an Average Joe I have no hope of running valuations based on fundamentals. Therefore I just work on the principle that in due course everything will average out. Maybe that's dangerous but it's something that at least I can understand. Sure we have seen inflated values for at least 16 years in the US but we have also seen PE10's in the US run well below average for many years in a row. For example the S&P500 PE10 fell below 16.4 in May 1973 and didn't rise back above it until March 1987. That's 14 years of "undervaluation". Gold is another prime example. It was unloved for at least 15 years. During that time governments ran deficits, inflated and expanded the money supply. Then all of a sudden everybody seems to want it. Did anything really change in the course of a couple of years? People became more aware and sure the situation became worse but why didn't the price reflect fundamentals and slowly increase continuously? I have no idea. Extremely helpful analysis, thank you! What is the source for the earnings data. 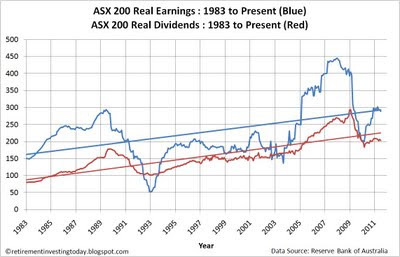 I read an Amp report that stated that the asx earnings data goes back to 1963.